Canola oil may not have the same cardiovascular benefits as extra virgin olive oil, but its bad press is overblown. Here are the facts. Let’s talk about canola oil. 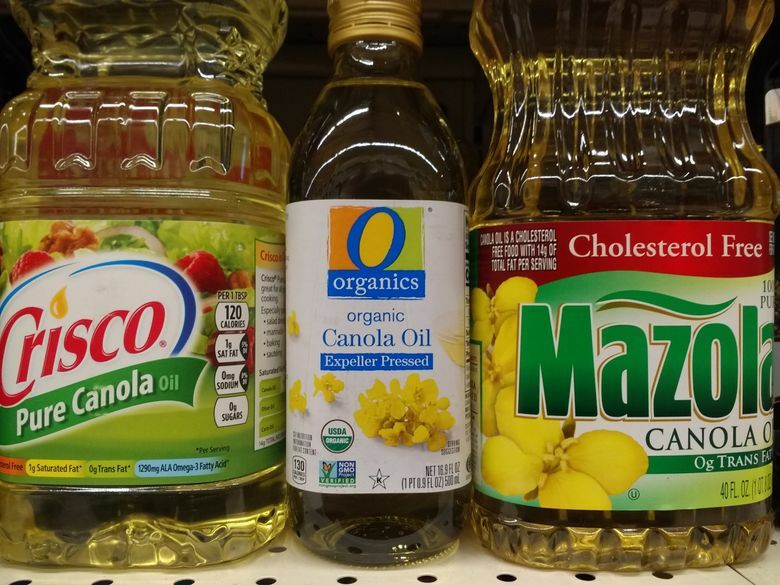 I hear the question “Should I avoid canola oil?” a lot. While extra-virgin olive oil is my go-to oil, I use canola oil when I need a neutral-tasting oil. But there’s a lot of negative information out there about canola oil, so I decided to delve into it — and discovered that most of it is based on myths and misinterpretation of scientific research. Canola comes from the same botanical family as broccoli, cabbages and cauliflower. It’s grown primarily in western Canada, but some is grown in the Pacific Northwest. About 80 percent of the canola grown in Canada is genetically modified (GM) to be herbicide-resistant. But only one protein in the plant has been genetically modified, and the oil itself doesn’t contain any protein. Much of the misinformation about canola oil stems from the fact that the canola plant is a cultivar of the rapeseed plant. Rapeseed oil contains very high levels of erucic acid, which in large amounts can be toxic to humans. However, canola oil — a contraction of “Canadian” and “ola,” which means oil — is bred to be low in erucic acid. It can’t contain more than 2 percent erucic acid; in 2017, the average level was only 0.01 percent. Once harvested, canola’s tiny black seeds are rolled or flaked to make the oil easier to extract. Next the seeds are cooked and mechanically pressed, which squeezes out most of the oil. Most of this expeller or “first press” oil is further refined because most consumer and food manufacturers want a neutral-flavored oil that doesn’t overpower the flavor of the other ingredients. For cold-pressed canola oil, on the other hand, the seeds are not heated before, during, or after the pressing process. Instead, they are cleaned, crushed and pressed slowly to limit friction and avoid raising the temperatures above 140 degrees Fahrenheit. The resulting oil is deep yellow in color, and has a much more distinctive flavor, which may be what you want when making a salad dressing or roasting vegetables. One of my concerns about refined canola oil was the use of solvents — often food-grade hexane — to remove as much of the remaining oil as possible after mechanical pressing. But I found out that the hexane is recovered in a process called desolventization so that it can be reused. The result? No residual hexane in the oil. So what about health benefits? There’s no research showing that canola oil has the same cardiovascular health benefits as extra-virgin olive oil. Due to its unsaturated-fat content, the Food and Drug Administration (FDA) does allow canola oil to carry the qualified health claim that it can reduce the risk of heart disease when used in place of saturated fat. Canola oil contains about two-thirds heart-healthy monounsaturated fatty acids and only about 7 percent saturated fatty acids — the lowest of any common cooking oil. It also contains polyunsaturated fatty acids, with almost 10 percent of the oil coming from alpha-linolenic acid (ALA), a plant-based omega-3 fatty acid. The bottom line? Canola oil’s bad press is overblown. It’s a neutral-flavored oil rich in heart-healthy fats, and its versatility makes it equally appropriate for salad dressings, marinades and cooking at whatever heat you need in your kitchen. Extra-virgin olive oil will remain my go-to, but for people who don’t appreciate its rich flavor — at least not all the time — canola oil is a fine alternative.